Many people living in San Diego are only a few paychecks away from becoming homeless. That’s why Father Joe’s Villages is here to provide services and programs that move people off the streets while they get back on their feet. John, a smart and skilled professional, was one of those people. John was the National Artistic Director for a large corporation. With an entrepreneurial spirit and $15,000 in savings, he decided to go out on his own and start is his own business. He had a strong start but overhead was high and John wasn’t able to turn a profit quickly enough, working through his savings. “Before I knew it, I had lost everything,” he said. Eventually, John became evicted from his apartment. Even his car was taken. 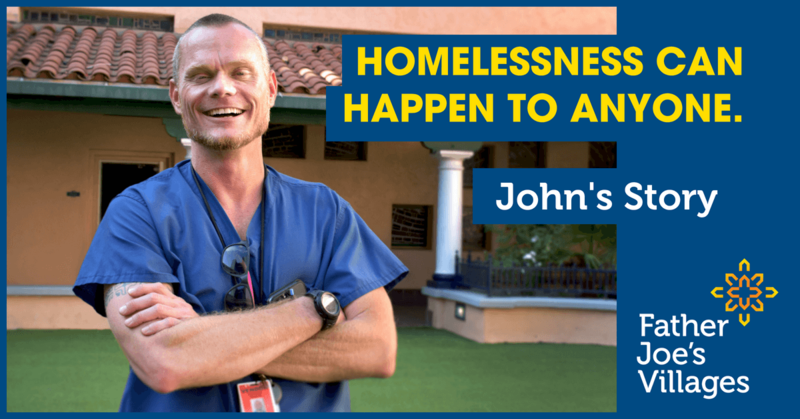 Without a support system to fall back on, John became homeless. Hungry, exhausted and scared, John attempted to work his way out of homelessness. However, after working for the same company for many years and then being self-employed, he wasn’t prepared for the modern job market. He found employment wherever he could and held a steady job for a while—borrowing work clothing from other people on the street. But, the minimum wage job wasn’t enough to afford housing. Unfortunately, the vacancy rate for apartments renting for $2,000 a month or less is 2% and only 3% of rental units in San Diego rent for $700-$1,000 per month. The San Diego Housing Commission’s 2017 Housing Report reports that 50% of San Diegans can’t find market-rate rental housing they can afford. After three months on the streets, John came down with pneumonia and ended up at a health center. They referred him to Father Joe’s Villages. He was welcomed into our Transitional Housing program, where he found all the resources he needed to get back on his feet. He was especially grateful for the Employment and Education Center and its Program Manager, Ray, who helped John prepare for his future. After regaining confidence in his skills, John concluded that he wanted to use his career to help others. 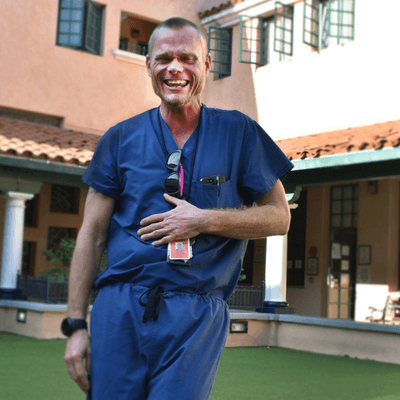 He found work as a caregiver, while also going back to school to become a medical counselor. He thrived in school, earning a 4.0 and perfect attendance. This paved his way for an externship at a prominent health center in San Diego, where he was later given a full-time job. Last month, John was able to save up enough to move into his own apartment. Not only that, but John is also well on his way to achieving his greatest dreams.